Build notification framework to send SMS Text messages and Emails in SSIS! Of the over 40 components in Task Factory the TF Advanced Email and SMS Task is one of my favorites. 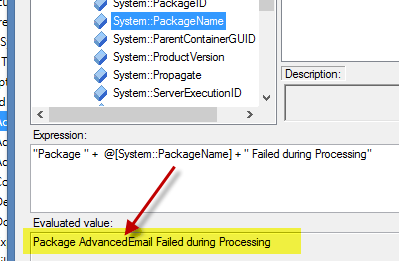 In this blog I am going to discuss the rich features this task offers and provide a walkthrough of setting this task up to send an email or SMS text message upon package failure. Supports Email and SMS messages. Can send emails with attachments. Inbuilt HTML editor for HTML email. Allows use of variables as placeholders in the Email Body so variables can be automatically replaced when an email is sent! Expressions can be set on properties to make the package dynamic. Note: We will be using SMTP connection information to set up our email connection manager. Generally a basic Bing/Google search will return the connection information required. For example Yahoo SMTP Connection info or Gmail SMTP Connection info. Ok let’s get started with our walkthrough. Please open up a new SSIS Package. Next click on the Event Handlers tab at the top. Don’t change the executable, by default it is set at the package level. Also leave OnError for the Event Handler. Next click on the hyperlink “Click here to create an ‘OnError’ event handler for executable ‘<Executable Name>’. Now pull in the Task Factory Advanced Email and SMS task. 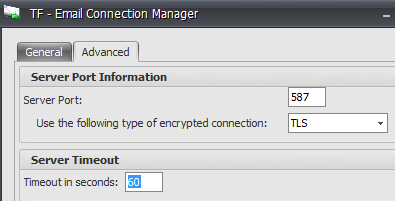 Next we will set up a new SMTP Connection Manager. 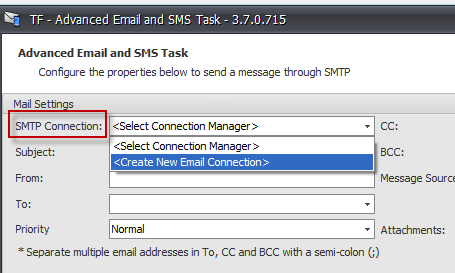 Select the drop down box next to SMTP Connection and then select “Create New Email Connection”. Finally test connection to validate and click ok to close. In this section I will demo how easy it is to set up the component to send either an SMS or Email message. Note all of this can be set up dynamically using variables and expressions! Select the dropdown for “To:” and select either email or SMS. Here I selected email and then manually entered the email address. Please note you can send emails to multiple recipients by separating them with a semi colon ;. Ok, next let’s override our email option and select SMS. First enter the phone number. In this section we are going to use expressions for the body and subject of the email. Note that expressions can be set on virtually every property of this component. Select the “Expressions” tab found at the bottom left of the TF Advanced Email editor. From the properties window select “Subject” from the drop down. In the “Expression” box select the Ellipsis button to open the expression editor. Once you have completed your expression for the Subject click ok and that will close the expression editor. 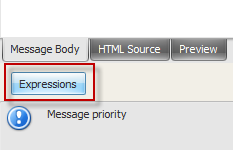 Now from the properties window select “Message” and once again select the Ellipsis button to open the expression editor. 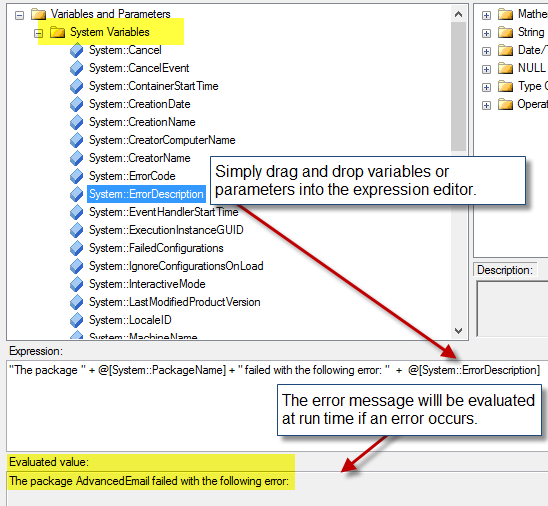 Now when I execute the package if an OnError event happens in the package and only if this event occurs then I will receive an email or text message! Here is the email I received upon failure of the package, pretty cool! Get list of subfolders in SSIS with SSIS Script Task! 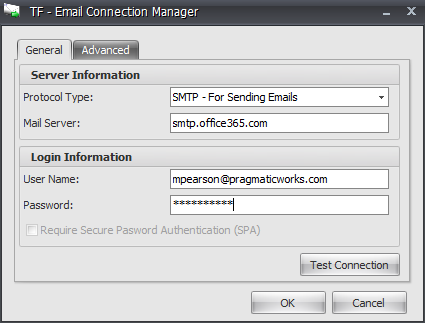 SSIS Email Connection Information for SMTP, IMAP, and POP3 connections.